The new Schleich Heroes are ready. They�re strong, they�re brave and remarkable. The new heroes are ready to experience new adventures with you every day. Our New Heroes are outstanding fighters from different cultures. They gather to form a group of the Chosen in order to fight side by side for Good. From the Fearless Roman soldier who fought under the command of Julius Caesar, to the Invincible Spartan from Ancient Greece. The Proud African: The Proud African is quick and very skilful with his spear, he has lots of practice through hunting for food. The Honourable Samurai: The honourable Samurai is a master of Asian martial arts. The Wild Viking: The Wild Viking wields an enormous double axe. 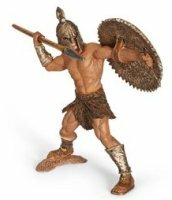 The Thracian: The Thracian is an experienced gladiator who has emerged victorious from all his battles to date. The Iberian: The Iberian wears a light suit of armour which makes him very fast and dangerous with his two swords. The Fearless Roman: Swings his sword high over his head and held his shield in front of him in defence. The Invincible Spartan: His spear is pulled back, pointing towards the enemy ready to throw.